Free agent running back Joseph Randle is once again in legal trouble, reports KAKE-TV in Wichita, Kan. The former Cowboy is now facing a felony charge stemming from allegations that he threatened a Sedgwick County Jail deputy on May 14. Randle was in Kansas awaiting dates on two other felony cases at the time, according to the Dallas Morning News. This represents the latest in a string of off-field incidents for the 24-year-old Randle, whom the Cowboys waived in November and who, as the Morning News details, accrued six arrests in an 18-month span at one point. Randle spent more than a week in jail in February after charges of aggravated battery, criminal damage and possession of marijuana led to an arrest. Prior to that, Randle was arrested at a Kansas casino in November and charged with one felony and five misdemeanors. Based on his arrests, Randle earned a four-game suspension from the NFL in November for violating its personal conduct policy. Teams had interest in possibly pursuing Randle before the announcement of the ban, but his ever-increasing rap sheet makes it unlikely he’ll ever suit up in the league again. Randle flashed plenty of talent on the field during his three seasons with the Cowboys, making his personal problems all the more unfortunate. After Dallas selected him in the fifth round of the 2013 draft, the ex-Oklahoma State standout totaled 822 yards on 181 carries, good for a stellar 4.5 per-rush average, and nine touchdowns in 35 games. Despite appearing in only six games in 2015 – all of which were starts – he set career marks in carries (76) and scores (four). Texas Tech offensive tackle Le’Raven Clark had 10 visits and 12 private workouts for teams in recent weeks, and has two more workouts this week with teams that pick in the back half of the first round, tweets Ian Rapoport of NFL.com. While Rapoport sounds bullish on Clark’s draft stock, I think the former Red Raider is more likely to come off the board late in the second round than late in the first. Although Baylor defensive lineman Shawn Oakman technically doesn’t yet face any charges stemming from his arrest for an alleged sexual assault, his case is expected to be presented to a grand jury, and there won’t be any resolution before next week’s draft, as Mike Florio of Pro Football Talk details. Per Florio, some observers believe Oakman’s draft stock will be affected to such an extent that he won’t be selected. The Dolphins didn’t publicly announce their pre-draft visits with prospects, but Barry Jackson of the Miami Herald was able to confirm 20 of those visits, and notes that the previously-reported visit with USC safety/linebacker Su’a Cravens never materialized, due to a schedule conflict. 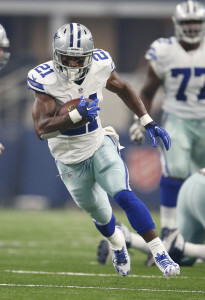 Reports from The Associated Press and The Wichita Eagle provide the latest updates on free agent running back Joseph Randle, who has repeatedly run into legal trouble since being released by the Cowboys in 2015. Bryce Johnston of Over The Cap takes an analytical look at Josh Norman‘s new five-year deal with Washington, examining the expected contract value and concluding that the standout cornerback is unlikely to be released until at least 2019. Former Cowboys running back Joseph Randle was arrested in Kansas Sunday morning on three counts of aggravated battery, one count of drug possession, and one count of criminal damage, according to a TMZ report. The incident marks the fourth arrest for the 24-year-old Randle in a little over a calendar year. While still on the Dallas roster, Randle was arrested last February after police found marijuana in his hotel room. In November, just three weeks after being waived, Randle was arrested at a Kansas casino and charged with one felony and five misdemeanors. And earlier this month, Randle was stopped and booked on a speeding charge. Sadly, those instances don’t mark the only off-the-field trouble with which Randle has been connected. Based on his arrests, he was suspended four games for violating the NFL’s personal conduct policy. Teams had had interest in possibly pursuing Randle before than ban was announced in November, and his latest string of incidents won’t help him find another job any time soon. Additionally, Randle is also facing accusations that his release from the Cowboys due in part to his partaking in sports betting. Sources told Brandon George of the Dallas Morning News that the club believed Randle “showed signs of mental instability,” and owner Jerry Jones confirmed the Cowboys were worried about Randle’s betting, but denied any evidence showed Randle bet on NFL contest. For his part, Randle denied the charges altogether. Veteran NFL running back Joseph Randle was released last fall in part because the Cowboys learned that he had been betting on sports, four sources told Brandon George of the Dallas Morning News. According to George, a combination of issues led to the Cowboys’ release of Randle, who showed signs of mental instability and allegedly wagered on sporting events during the 2015 season. For his part, Randle is denying the allegations that he was involved in gambling on sports, telling Drew Davison of the Fort Worth Star-Telegram in a text message that there’s “no truth at all” to the accusations. The NFL has a strict gambling policy in place prohibiting players and league personnel from sports betting. Whether or not the latest allegations against Randle are true, he continues to have a hard time staying out of trouble off the field. As we noted yesterday, the free agent running back was arrested early Monday morning in Irving and booked on a speeding charge. A source tells George that the Cowboys “remain concerned for Randle’s well-being and believe he needs serious help.” The Cowboys, the NFL, and the NFL Players Association have all reached out to the 24-year-old to offer help on several occasions, but he has turned down those offers, according to George. For now, Randle remains available to sign with any team, but given these latest allegations, along with the potential discipline he’ll be facing for his most recent arrest, it seems unlikely that suitors will be lining up to roll the dice on him this offseason. The NFL announced today that it has reached an agreement with CBS and NBC to expand its Thursday Night Football package for the 2016 and 2017 seasons. While all of the Thursday night games will continue to be either aired or simulcast on the NFL Network, CBS will now show five of the games, while NBC will show another five. According to a CNBC report (via Twitter), the fees for the Thursday night rights will be approximately $450MM. Although CNBC doesn’t specify, it’s probably safe to assume that each network will be paying that amount for the right to air a total of 10 games each – five per season – in 2016 and 2017. In 2015, CBS paid $300MM for eight games, so a bump up to $450MM for 10 apiece makes sense. Former Cowboys running back Joseph Randle has run into more trouble off the field, according to Matt Peterson of the Dallas Morning News, who reports that Randle was arrested early Monday morning in Irving and booked on a speeding charge. Randle’s off-field behavior was a factor in the Cowboys’ decision to release him in the fall, and it’s hard to imagine him getting a chance from another team if those legal issues persist. In a piece for PhiladelphiaEagles.com, Tony Pauline of DraftInsider.net focuses on the top quarterbacks available in this year’s draft, writing that Carson Wentz‘s stock is on the rise, and he and Jared Goff could both be top-five picks this spring. NFL decision-makers are also bullish on Christian Hackenberg‘s upside, and he’s expected to come off the board in the top 75 picks. Within that same piece, Pauline also suggests that Ohio State’s Nick Vannett could be the first tight end selected in the draft, and says Boise State safety Darian Thompson saw his stock rise at the Senior Bowl. In a memo, the NFL Players Association has indicated that agents are now required to contact the union at the “beginning of substantive discussions” on veteran re-negotiations worth at least $2MM per year, tweets Rand Getlin of the NFL Network. While the exact reason for this change is unclear, Getlin – citing “smart folks behind the scene” – suggests it may be a reaction to players signing extensions that didn’t thrill the NFLPA (Twitter link). The NFL announced its 2016 lineup of London games today, and the Rams are one of three teams giving up a home game to play overseas. However, as Jacob Kirn of the St. Louis Business Journal writes, that would seem to violate the terms of the team’s lease with the Edward Jones Dome. Of course, the franchise’s future in St. Louis beyond this year remains up in the air, so it’s possible there will be no lease with dome in 2016 to violate. For what it’s worth, the St. Louis stadium task force issued a statement today indicating that if the Rams were to enter discussions with the task force about the riverfront stadium proposal, then “we’re certain accommodations can be made for the Rams to play one game in London next season.” As is, this looks like just another small piece in a complicated Los Angeles puzzle. Just three weeks after he was waived, former Cowboys running back Joseph Randle was arrested on Tuesday after an incident at the Kansas Star Casino in Mulvane, Kansas. Randle, who had already been suspended by the NFL for a previous arrest, was charged with one felony and five misdemeanors, further reducing the possibility of him signing with a new team anytime soon. Robert Wilonsky of the Dallas Morning News has the details on the incident, including the specific charges Randle is facing. The NFL’s three London games may not be the league’s only international contests during the 2016 regular season. Per Albert Breer of the NFL Network (Twitter link), the league is working on a logistics issue relating to a possible Mexico City game, but is “well along” in the process, and there’s a good chance a November ’16 game will be scheduled at Azteca Stadium. While there have been proposals to push the NFL vote on Los Angeles further back, Sam Farmer of the Los Angeles Times (Twitter links) says that’s unlikely to happen due to the league’s schedule release. As Farmer explains, forcing a late vote would risk get the moving team(s) off on the wrong foot in a challenging market. The Steelers didn’t open the 21-day practice window for tackle Mike Adams prior to Tuesday’s deadline, so his 2015 campaign is over before it began, tweets Mark Kaboly of the Pittsburgh Tribune-Review. Adams started the year on the PUP list and would have had to begin practicing yesterday to have a chance at being activated this season. Instead, his contract is expected to toll, meaning he won’t reach unrestricted free agency. A group of league officials will be in Mexico City through Wednesday to determine if Azteca Stadium is prepared to host an NFL game in 2016, tweets Albert Breer of NFL.com. Back in 2005, the Cardinals and 49ers faced off at Azteca in front of a crowd of 100K+, so the league knows that the interest is there. One team that had been interested in free agent running back Joseph Randle is no longer pursuing him now that he has received a four-game suspension, tweets Ed Werder of ESPN.com. Bears practice squad wide receiver Jalen Saunders has been suspended four games for violating an undisclosed league policy, according to a source that spoke with Ian Rapoport of NFL.com (on Twitter). Saunders, a fourth-round pick in 2014, was one of several draft choices for the Jets under former GM John Idzik that did not pan out. Another wideout, Clyde Gates, has also been suspended four games by the NFL, according to Aaron Wilson of the Houston Chronicle (Twitter link). Gates, currently a free agent, is also a former Jets receiver, though he started his career with the Dolphins after being selected in the fourth round of the 2011 draft. Despite his stellar season so far, TCU quarterback Trevone Boykin will likely transition to the wide receiver position for the NFL draft, Jason Cole of Bleacher Report (video link) reports. In a piece for CBSSports.com, former agent Joel Corry take a look at players in contract years who are helping or hurting their respective values as they approach free agency. Jason Fitzgerald of Over the Cap also looks forward to free agency, examining a few quarterbacks who could hit the open market this winter, and identifying some potential trade candidates at the position. Former Cowboys running back Joseph Randle has been suspended without pay for four games by the NFL for violating the league’s personal conduct policy, reports Ian Rapoport of NFL.com (via Twitter). Randle has been a free agent since being cut by Dallas, and this news won’t help him as he attempts to find a new job. Randle’s four-game ban presumably stems from a February incident in Wichita, Kansas, which saw him arrested for unlawful possession of marijuana after police received a call for an alleged domestic incident involving Randle and the mother of his son. Charges against the 23-year-old were dropped in April, but the NFL continued its own investigation, reportedly meeting with Randle over the summer, and again in October. Randle, 24 in December, was expected by many to emerge as the leader in the Cowboys’ fractured backfield this season, following the offseason departure of DeMarco Murray. However, with Randle suffering from an injured oblique and dealing with off-field issues, he lost his starting job and eventually his spot on the Cowboys’ roster, having rushed for just 313 yards on 76 attempts in the first half. Based on a tweet from Ed Werder of ESPN.com this morning, it sounds as if there were teams with interest in Randle, but those clubs were waiting to hear on his potential suspension. Rapoport (Twitter link) had reported a couple weeks back that the running back would likely face a one- or two-game suspension, so potential suitors may be put off by the longer ban. Former Cowboys running back Joseph Randle went unclaimed off waivers on Wednesday and is now free to sign with any NFL team. Randle was jettisoned from Dallas on Tuesday. Randle was arrested in February in Wichita, Kansas for unlawful possession of marijuana after police received a call for an alleged domestic incident involving Randle and the mother of his son. Charges against the 23-year-old were dropped in April, but the NFL continued its own investigation, meeting with Randle over the summer, and within recent days. It’s not known yet if Randle will receive a suspension or merely a fine for the incident, but it appears he’ll be disciplined by the league in some form. Ian Rapoport of NFL.com – who notes that the NFL is applying the personal conduct policy, rather than the domestic conduct policy, in its investigation – tweeted recently that Randle will likely face a one- or two-game suspension. Any team with interest in Randle will have to not only take his off-the-field issues into consideration, but also the fact that he could be sidelined for a couple of games. 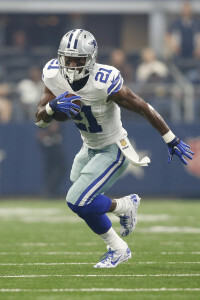 Randle, 24 in December, was expected by many to emerge as the leader in the Cowboys’ fractured backfield this season. After chiding ex-teammate DeMarco Murray for leaving a lot of “meat on the bone,” Randle has taken only a couple bites so far this season. In six games, Randle has rushed for 313 yards off of 76 carries. The Cowboys will release running back Joseph Randle, according to Clarence Hill of the Star-Telegram (on Twitter). The move marks an end to a bizarre situation that has unfolded between the talented tailback and the team. Randle was arrested in February in Wichita, Kansas for unlawful possession of marijuana after police received a call for an alleged domestic incident involving Randle and the mother of his son. Charges against the 23-year-old were dropped in April, but the NFL continued its own investigation, meeting with Randle over the summer, and within the past week. It’s not known yet if Randle will receive a suspension or merely a fine for the incident, but it appears he’ll be disciplined by the league in some form. Ian Rapoport of NFL.com – who notes that the NFL is applying the personal conduct policy, rather than the domestic conduct policy, in its investigation – tweeted recently that Randle will likely face a one- or two-game suspension.